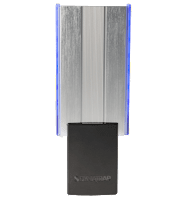 DynaTrap’s newest product uses proprietary tech to deliver superior protection against disease-carrying insects — all in an attractive, discreet sconce design. Here at ChiIL Mama we adore spring through fall in Chi, IL, but not the influx of insects those seasons bring. We've had a plague of moths for years, that came in a bag of bird seed and return to their place of birth year after year. The city also has more than it's fair share of flies! In the past we've put up ugly fly paper in the yard and enclosed back porch as they come through the dog doors. Now we're thrilled to have a more effective, and much more attractive option, the DynaTrap® Flylight! Check back soon for my full review and a giveaway too. We're excited to partner up with Dynamic Solutions and will be sent a complimentary sample for review purposes and for our readers. Flylight is brand NEW and just debuted at the giant International Home and Housewares Show in Chicago this month. They have a plethora of products for indoors and out. We've tried a couple in past years and were quite impressed. DynaTrap® is the creator of technology-driven, indoor/outdoor insect and mosquito traps that are chemical, pesticide, and hassle free. Flylight delivers up to 600 square feet of superior protection against disease-carrying flies, mosquitoes, and other flying insects. 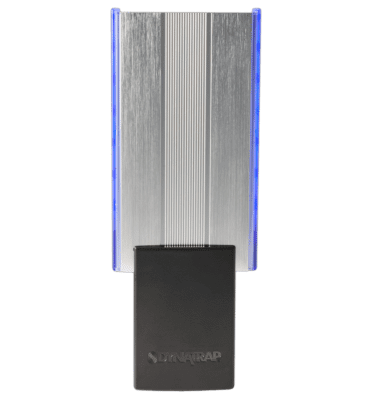 It utilizes DynaTrap’s proprietary AtraktaGloTM Technology to produce a warm UV light at a specifically targeted wavelength, which is irresistibly attractive to insects. The non-toxic StickyTechTM Glue Card then traps the bugs and conceals them behind a sleek, decorative aluminum panel. “While nearly everyone looks forward to the warmer weather brought by spring each year, nobody likes dealing with the pesky and unhealthy presence of fruit flies, gnats, pantry moths, fleas, and other flying insects that often make their ways indoors. 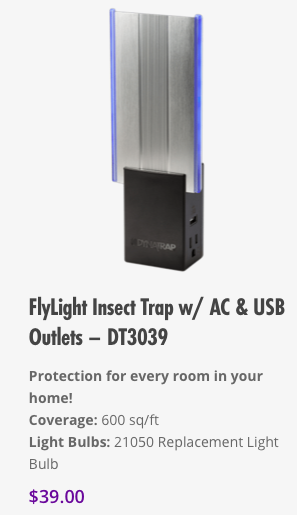 Flylight is the easiest and more effective way to stave off the bugs — just plug it in, let it run, and enjoy a bug-free home.” said Juan Rocha, President of DynaTrap. Flylight comes in three different models, as well as two different color options — black and white. The deluxe model comes with two AC outlets and two USB ports to maximize outlet utility. Each Flylight comes with a replaceable UV Bulb (rated for approximately 3000 hours), three StickyTechTM Glue Card replacements (that last approximately 30 days each), and a one-year warranty on the device. For more information on DynaTrap, please visit https://www.dynatrap.com. Dynamic Solutions Worldwide, LLC creates technology-driven indoor/outdoor insect traps that protect against mosquitoes, biting flies, moths, wasps, and more. Unlike other bug prevention solutions, Dynamic Solutions Worldwide, LLC produce products that are uniquely chemical- and pesticide-free, affordable, easy to maintain, environmentally friendly and most importantly—effective. Disclosure: ChiIL Mama is excited to partner up with Dynamic Solutions and will be sent a complimentary sample for review purposes and for our readers. As always all opinions are my own.